Please download our app for a more effective job searching experience on this mobile device. Want to manage your job search from your mobile device? 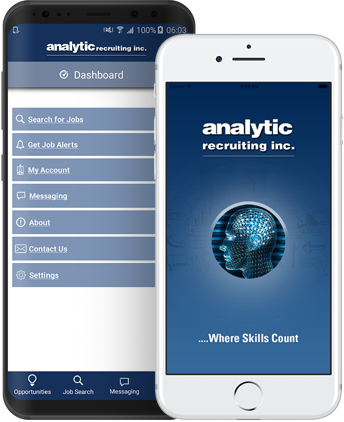 The Analytic Recruiting App enables candidates to manage their job search efficiently; to identify and apply for jobs in their field(s) and to communicate with the recruiters using their mobile device. The app simplifies job searching by storing individual preferences and objectives and by eliminating the need to re-enter job search criteria. With only one click, job seekers can view the newest jobs that match their search parameters in their targeted specialties and locations. © 2018 Copyright to Analytic Recruiting Inc. • All Rights Reserved.